Get-out-the-vote efforts often don't ramp up until after Labor Day, but this time around in the presidential battleground of Virginia, the work started months ago. Volunteers are at the heart of the intense effort to win Virginia. For northern Virginia campaign volunteers on both sides of the presidential contest, there are no summer doldrums. They’re fully engaged in one of the most intense efforts ever waged in the commonwealth to win voters to their side. 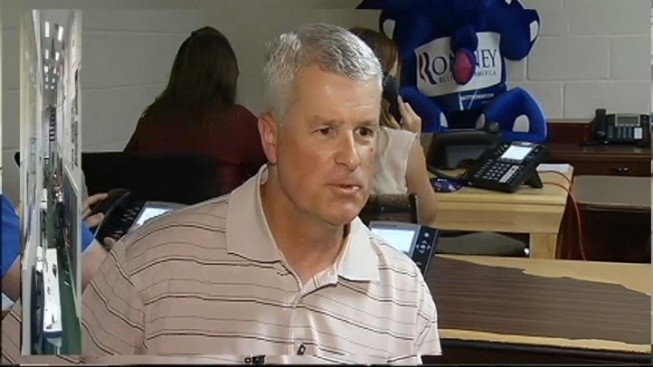 Romney volunteers have already made 1 million voter contacts through phone banks or door-to-door. “We are mounting the biggest GOP get-out-the-vote effort in Virginia history,” Romney Virginia Communications Director Curt Cashour said. For Jan Burford, a desire to help Mitt Romney has him doing campaign volunteer work for the first time. He said he thrives on door to door calls every Thursday. At the Obama for America office in Manassas, volunteers are preparing for what they're calling a "women's weekend of action." Harriet Carter first volunteered for the Obama campaign in August 2008. This time she jumped in much earlier -- in May -- and has already put in many hours as a neighborhood team leader. Sherron Day is a newcomer to the Obama campaign, signing on to help earlier this summer after hearing the first lady speak. She spends a day a week volunteering. “One work shift a week is not too much to give to a campaign that is so important to all of us,” she said.